A garage can be either a separate independent structure, or it can be attached to or built into a building. Regardless of the size and shape of the building, everything inside should be properly equipped, in particular the floor. In most cases, a concrete base is chosen for the floor, but many also prefer to make wood floors. If you follow all the rules of installation and use of quality materials, you can build a solid foundation with your own hands. 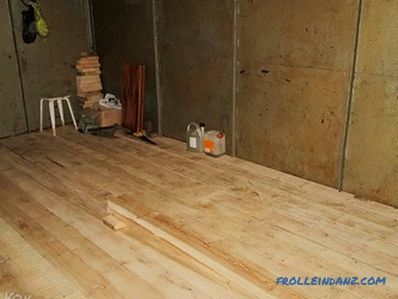 This article will discuss how to make a wooden floor in the garage with your own hands. Despite the fact that many consider wood to be an inappropriate material for arranging the floor, it is worth noting some of its advantages. So, wood is a durable and high-strength material. 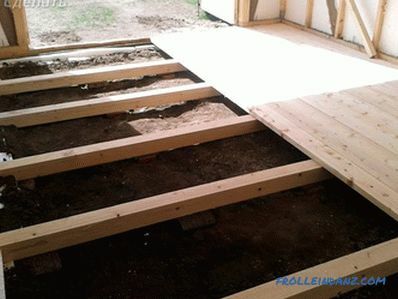 An important step in the installation of the floor is the choice of wood. 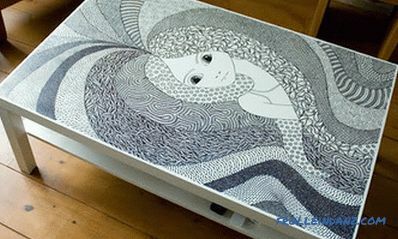 The best option is to buy ready-made boards from a reliable supplier. Consultants and managers in hardware stores will be able to help make the right choice and calculate the required amount of materials, as well as fasteners. You should not choose too dry or wet wood. It is important to verify the absence of deformation: cracks and knots. It is necessary to adhere to the basic requirements for size: thickness - from 2.5 cm, length - from 2 m. In addition to the main boards, you will also need supporting transverse lags, which will be installed at a certain distance. All material must be taken with a margin. When buying a cross lag, it is better to choose a standard size, namely 10x10 cm. Before laying in the garage, you need to process logs with a special compound and dry them. First, the base is prepared, namely, a cushion is put in from the mixture: sand, clay, gravel (equal proportions). It is very important to make tamping pillows, before carrying out subsequent work. The base should have a flat surface, since the entire device of the wooden floor rests on the posts, which can be arranged from bricks or concrete piles. The choice must be made on the availability of materials or in accordance with personal taste preferences. When placing the posts, you should focus on the future location of the car to maximize the strength of the wooden floor. The distance between the pillars should be about 1 m.
Lags are placed on the prepared base, this is done perpendicular to the entrance. All bars are placed at the same distance (from 30 to 50 cm) from each other in the same direction. Anchors are used for fixing the log to concrete or brick posts. When choosing a lag, the height of which will raise the entire base of the floor, it is important to consider their size. Otherwise, at the entrance to the garage is formed too much difference or step. 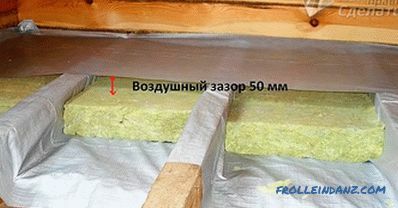 It is not necessary to lay the insulation layer on the floor, but if you warm the garage, you should not skip this stage. 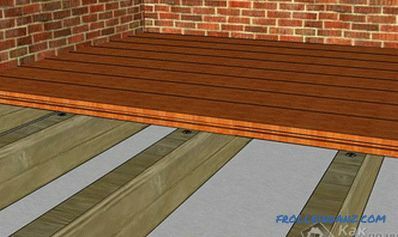 First you need to hem the rough floor, and waterproofing is carried out on top of it using plastic film or roofing felt. 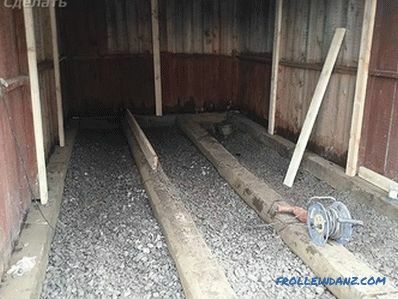 After all the logs are installed, you can proceed to the direct installation of boards. They need to lay on the movement of the car, in this case, the floor will last much longer. It is possible to fix the floor slats to the lags using self-tapping screws. 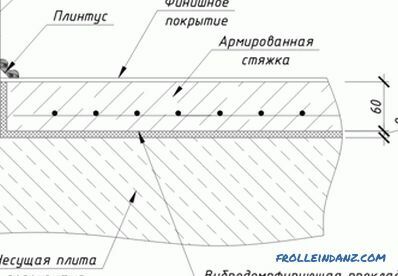 For this, it is very important to follow the correct fixation pattern: in each board, drill holes of slightly larger diameter than the self-tapping screws used, thanks to which the installation process will be faster. 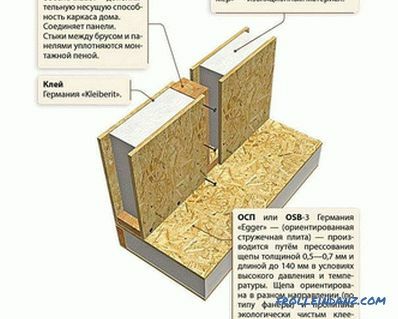 As a result, the fixed wooden boards will be attracted well to the lags, and during operation no curvature and unevenness will form on the floor. The air in the garage is high humidity, so it is worth treating all the sawn timber with special antiseptics, as well as fire fighting compounds. 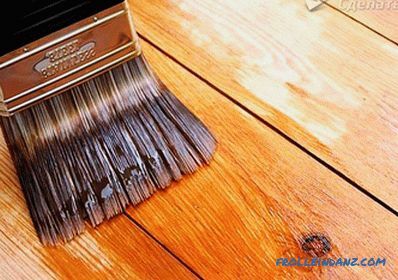 Lacquers will help preserve the natural texture and pattern of wood, due to the formation of a transparent film. This tool has a large number of bioprotective properties that protect the wood from rotting or insect infestation. With the help of paint, you can give the floor any shade, as well as protect it from moisture, condensation, minor mechanical damage. 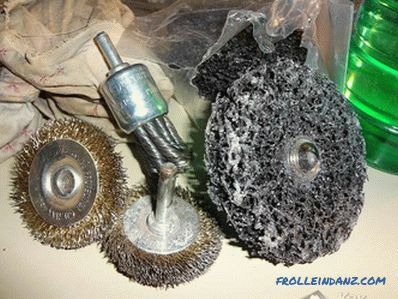 Antiseptics belong to innovative multifunctional tools that will protect the floor from moisture, fungi, as well as improve fire-fighting properties.